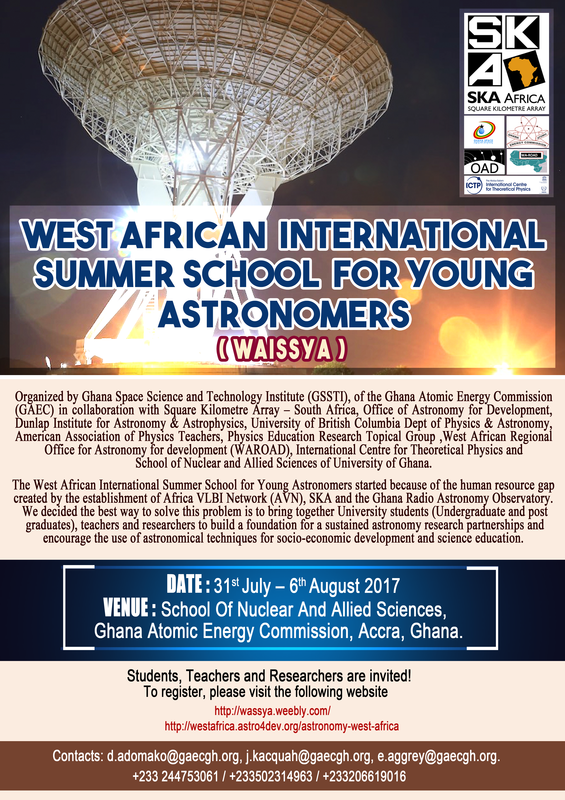 From July 31st to August 06th 2017, Ghana will host the second edition of the West African International School for Scientists and Young Astronomers (WAISSYA). This will be a unique regional opportunity to interact further towards creating a stronger teaching and research community in astronomy in/for Ghana and the whole of Africa. Together with committed local and international partners, the (West African) Regional Office of Astronomy for Development (﻿ROAD﻿), a branch of the International Astronomical Union Office of Astronomy for Development (IAU/OAD) is a driving force behind the 2017 WAISSYA school in Accra, capital city of Ghana.